Let’s say my brother gets in a dispute with someone else, perhaps even someone I am acquainted with. Would anyone think that I would be the appropriate person to mediate that conflict? If my brother also had a lot more money and influence in the conflict, and therefore a fair mediation needed a broker who was willing to pressure my brother into compromise because, right or wrong, he does not have incentive to do so. Am I the person to be expected to level that playing field? Of course that would be absurd, yet that is exactly what has been expected of the United States. The comparison goes even deeper because the political forces in the United States, as my father would do in this scenario, exert personal pressure (familial and financial) favoring my brother. This is also quite natural, but it isn’t justice, and it is a recipe for disaster, not resolution. U.S. Secretary of State John Kerry now says that the United States is going to “re-evaluate” its efforts for Israel-Palestine peace. But will that be an honest evaluation, one which asks the hard questions? Because after twenty years of failure, there is but one fundamental question: is the United States, given its self-imposed diplomatic parameters and its AIPAC-directed domestic political obstacles, capable of mediating this conflict? We need to understand, when evaluating the Obama Administration’s performance here, that, reality aside, it is perceived as the toughest on Israel since George H.W. Bush. And, to be sure, it worked harder to get small concessions from Israel than its predecessor in the George W. Bush administration. But for those who still don’t understand the extent to which U.S. policy prioritizes Israeli preferences over basic Palestinian needs, this past week’s events should have made it clear. Indeed, it is because of that potential clarity that Israel has moved immediately to replace the facts with their own, demonstrably false, narrative. Let’s review the collapse of the Kerry Talks. Eight months after scoring his victory in getting Israel and the Palestinians back to talks, Kerry had nothing but increased acrimony between the two parties to show for it. For many weeks, both Israel and the Palestinians had tacitly recognized the futility and had directed their efforts toward jockeying for position to emerge from the inevitable collapse of talks as the more reasonable side. As the date that had been designated for the fourth and final release of 26 long-time Palestinian prisoners approached, Israel began to signal it would not follow through on its agreement to let them go. And Kerry’s frank incompetence started to become even more apparent. Israel had been saying for weeks that the last batch of prisoners included Palestinian citizens of Israel whom they had not agreed to release. It is unclear exactly what happened here, but Kerry gave no indication that Israel was not being honest about that claim. The picture that emerged was that Israel agreed to the 104 prisoners being released but not necessarily to these specific ones, who, as citizens of Israel, do fall into a different category. Rather than clarify, it looks like Kerry simply assured Palestinian President Mahmoud Abbas that he’d convince the Israelis to get it done. If that is what happened, it indicates a serious lack of understanding on Kerry’s part of the difference the Israeli status of those prisoners made in Israel. It would mean that the Secretary of State was woefully ill-suited to this task. Had Kerry bridged this gap, it might have been enough to move the prisoner release forward. This was the objection Israel started with. But by the time March 29, the date designated for the last prisoner release, approached, Israel, certainly with U.S. agreement, shifted gears and made the release contingent on the Palestinians committing to continuing the talks for another twenty months. This sat well with Kerry, since at this point, all he was really after was continuing the talks. Goals of substance had long since evaporated. Seeing that the Palestinians were not going to agree to this arrangement, Kerry tried to get Israel to sweeten the deal with a phony limitation on settlement construction that committed Israel to nothing at all and guaranteed accelerated settlement expansion in the Jerusalem area; and the freeing of 400 additional prisoners of Israel’s choosing which would have almost certainly meant freeing thieves and other common criminals whom the Palestinians would not necessarily even want back. In exchange for this Israeli “largesse” not only would the talks be extended, but the U.S. would give Netanyahu a massive political plum to please his right wing: the freeing of convicted U.S. spy Jonathan Pollard. Kerry secured Netanyahu’s agreement then started off to show the Palestinians this deal he had worked out with Israel and get them to accept it. He never got that far, because that was when the Palestinians finally said “enough” and began applying for membership in numerous international bodies, as is their right. 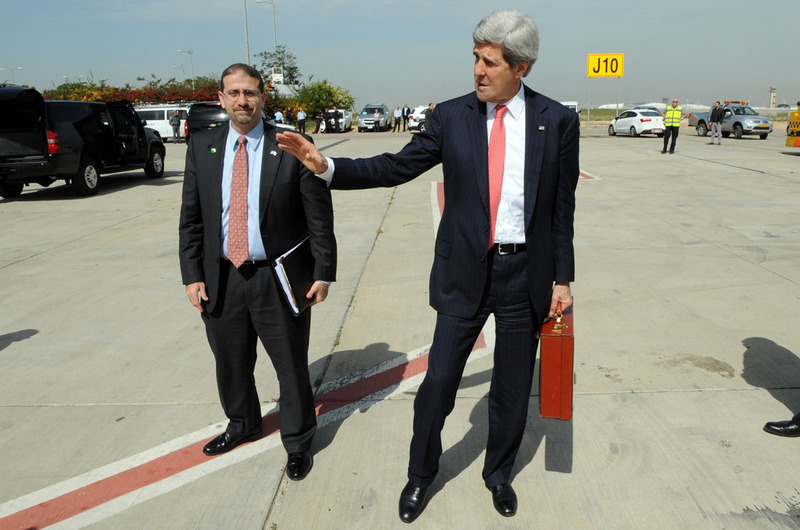 When Kerry left the region in a huff, he blamed both sides for taking “unhelpful” and “unilateral” steps. That, in itself, is an inaccurate description of a collapse that was largely engineered by Israel, but it was clear that the Obama Administration was going to go farther. U.S. Ambassador to the United Nations, Samantha Power expressed the Administration view clearly in her testimony before House of Representatives subcommittee hearing on UN funding. So it is either the Palestinians’ fault for threatening to hold Israel accountable for its actions in the international legal system or it’s both sides’. No administration official has singled out Israel for its actions as they have the Palestinians, despite the fact that the Palestinians were acting on their rights which they had only agreed to hold off on as long as Israel lived up to its commitments and kept the talks going. It was Israel, not the Palestinians who reneged, and while the United States is well aware of this, they won’t say it. Instead, U.S. officials are helping clean Netanyahu’s image by shifting the blame for the announcement of new settlement units to Housing Minister Uri Ariel. Ariel, of the Jewish Home party which is a right wing rival of Likud, certainly seized an opportunity to torpedo any peace talks, in line with his views and his party’s policies. But the idea that this was done behind Netanyahu’s back is absurd. Netanyahu has offered no rebuke of Ariel, nor has he distanced himself at all from the announcement of the new settlement units or the timing of the announcement. Given that Kerry had made an emergency trip to the region just at that time, even most of the right would not have had a problem with Netanyahu putting the new buildings on hold for a while. No, this was not Ariel’s initiative. It was Netanyahu’s. The Palestinians applied to fifteen international bodies. But the ones they chose to apply to pose no threat to Israel. Indeed, if anything, the choices they made, which largely consist of various human rights conventions, serve to make the PA, not Israel, more accountable. The PA made a point of not applying to the International Criminal Court, which is Israel’s chief concern. The applications they made only moderately upgrade the Palestinians’ status, acquired over a year ago when they won admission to the U.N. General Assembly as a non-member observer state. The applications are, certainly, a threat that they will do more if things keep going as they are. Israel has declared that it will punish the Palestinians, though so far, aside from officially cancelling the last prisoner release, the only specific measure they have announced is the withdrawal of a permit for a West Bank telecommunications company to start building its wireless infrastructure in Gaza. There will likely be more measures soon. But the telling point is the absolute absence in Israel of any criticism of Netanyahu for the collapse of the talks. The parties in the governing coalition that were supposed to hold Netanyahu to the peace track, Yesh Atid and HaTnuah, have been unwavering in their support of Netanyahu since the talks collapsed. The major opposition parties, particularly Labor and Shas, have either been silent or offered measured support to Netanyahu. It is clear that Netanyahu faces no pressure to modify his position. This tells us that Israel is going to continue on its present course. It leaves little doubt that Netanyahu is perfectly comfortable with Kerry simply giving up and turning his attention to other matters. And why shouldn’t he feel that way? Congress remains locked into mindless obedience to any and all Israeli actions, and the Obama Administration has made it clear it is not going to spend the political capital necessary to bring about any changes. Now that Abbas has finally reached the point where he could not accept another one-sided U.S. proposal, he needs to consider what to do now. He has thrown down a gauntlet with his applications to the international bodies. The message was that Palestine would take full advantage of its rights if Israel was not willing to negotiate in a spirit of compromise that acknowledged the legitimacy of Palestinian claims, as the Palestinians have for years with their surrender of 78% of Palestine and acceptance of the principle that Jerusalem would be shared and that implementation of the refugee rights would be negotiable and consider Israel’s demographic needs. Abbas absolutely cannot be seen to be bluffing. If Israel does not change its stance, he must apply to the International Criminal Court for recognition of Palestine and begin bringing war crimes cases there. There is a reason Ambassador Power considers this a real threat to Israel. Of course, the United States will shield Israeli leaders from imprisonment if they are found guilty by the ICC, but Israeli leaders will find themselves unable to travel to Europe, which, despite U.S. largesse, is by far Israel’s biggest trading partner. That matters, a lot. Abbas must be willing to follow through, even though he is unlikely to be around for the endgame. Israel would certainly respond harshly to such actions, and the PA is not going to survive that kind of Israeli action. That’s why Abbas will be sorely tempted to find another way. But, as we’ve already seen, popular pressure is beginning to boil in the West Bank. The breakdown of these talks is a turning point. Yes, there will be desperate cries for another “last chance” for the Oslo-based two-state solution, but there is a growing realization that this is now a pipe dream. The United States will likely continue for some time to play the same role it has for twenty years, but if this round generated miniscule hope, future attempts will be met with virtually absolute cynicism. The politics of all of this is going to move farther away from Washington, although the pull from Congress will slow the process. But even the bought and paid for Congress won’t be able to stop it. Europe will be forced to take more actions, and Israel is going to be increasingly isolated. The parameters are becoming more fluid and, in a departure from the Oslo years, the new ones are going to be dictated by events in Israel and the Palestinian Territories more than in Washington. The smart thing for Washington to do is to reset the process, bring together real experts — rather than the AIPAC-endorsed lawyers for Israel like Martin Indyk, Dennis Ross and David Makovsky — with leaders from Israel, Palestine, Europe and the Arab world and start over. There may be a way to find a formulation, whether one state or two, that justly addresses Palestinian rights as well as Israeli ones. But it must start with admitting that the Oslo process is dead and failed. Continuing self-deception, whether from right-wingers like Netanyahu who gamed the system, or well-meaning centrists like J Street who staked their existence on the vain hope that this process, ill-formed at birth, could ever succeed must be treated now like the threat to any progress that it is.